Actor/director Eriq La Salle is best known to worldwide television audiences for his award-winning portrayal of the commanding Dr. Peter Benton on the critically acclaimed and history-making medical drama ER. Educated at Juilliard and NYU's Tisch School of the Arts, his credits range from Broadway to film roles opposite Eddie Murphy in "Coming to America" and Robin Williams in "One Hour Photo." La Salle has maintained a prolific acting career while at the same time working steadily as a director, taking the helm for HBO and Showtime in addition to episodics such as Law & Order, CSI: New York and A Gifted Man, to name a few. This year he marks the beginning of the third element of his triple-threat career with the publication this summer of his first book in a trilogy, the page-turning thriller Laws of Depravity. Eriq La Salle has carried over his characters Phee and Quincy from the last nail biter, Laws of Depravity, to Laws of Wrath. Phee and Quincy are on a well-earned leave after their last thrilling case, only to be called back from their brief vacation. A Satanist group has started leaving hollowed-out bodies with startling ties to the duo. The leader, a woman who considers herself a god, still runs things from inside her prison cell. When Phee's older brother becomes one of the cult's victims, the two men must seek her help to solve this baffling and gruesome case. It isn't long before their own skeletons begin to fall out of the closets. Dealing with their families' pasts becomes equal to the mystery in their laps. The danger creeps up on the partners fast, leaving them to fight for one of their own. The priest murders from their last case begin to resurface and, like a scream in the night, will leave the two with whirling heads as the story continues (hopefully) in another book. Eriq La Salle did a fabulous job melding Laws of Depravity into the next book in his series, Laws of Wrath. The story line could be present day, its realistic descriptions are so chillingly believable. This book is not for the faint of heart. There are graphic scenes that some may prefer to avoid. I found myself rather disturbed initially but once I realized that this was part of the first book, it all fell into place. Mr. La Salle surely has a best seller here!! In Laws of Wrath, Detectives Phee Freeman and Quincy Cavanaugh are enjoying their two months of paid leave after solving the Deggler case which exhausted them physically and mentally. However, their relaxing time is cut short when Phee’s transvestite older brother, A.J., is brutally killed. Despite his strained relationship with A.J., Phee is determined to work on the case and stop the killer. It turns out that similar cases had occurred three years ago in Queens supposedly by disbanded cult. Author Eriq La Salle captures the darkest parts of human society, the ones we try to correct – not necessarily in the proper way – and often try to hide or ignore. Readers are tempted with great curiosity with the introduction of Dr. Dalia Zibik who arrives at Bedford Hills, a female maximum-security prison, together with other new inmates. Described as a plain average woman, we wonder how this character ends up in prison and how is she going to fend for herself when Queenie, a dominant inmate, already picked the doctor as her plaything. Without revealing any spoiler, it is suffice to say that Zibik will surprise us. It also shows that La Salle knows how to create a suspenseful twist. The writing style is faultless and straightforward yet adroit. The chapters are neither too short nor too long, a welcome addition to the perfectly balanced pace of the plot. In the end, La Salle presents readers with an epilogue which slyly indicates that an old case that Phee and Quincy struggled to solve might rear its ugly head again. La Salle holds no punches and weaves a story that is a perfect "looking glass" reflection of our structured culture. It is a compelling story that is so well-developed that some readers may question whether parts of it are truly fiction. Although some sensitive readers might cringe, it is undeniable that this gripping urban thriller will satisfy fans of the genre. I was captivated and frightened by the prologue in which we are introduced to Dr. Dalia Zibik, a small, harmless-looking woman who was serving time at Bedford Hills, a maximum security women’s prison. The prison had its hierarchy and Queenie was the ruler. The woman was a prisoner but the guards turned their backs on any transgressions that she committed. The Warden may pretend to be in charge but everyone knew, guards and prisoners alike, that Queenie ruled with an iron fist - until Dr. Zibik arrived and was summoned to Queenie’s cell. Dr. Zibik was a Satanist with quite a fan club. Could there be a link between the imprisoned doctor and AJ’s vicious murder? Laws of Wrath will keep readers up at night, contemplating what evils man will commit in the name of wrath. Once again, La Salle proves his skill at developing characters. Before I closed the cover of this book, I felt as if I knew each character, flaws and all. There are twists and turns that kept me on the edge of my seat. This is not a book you want to read when alone at night. I suspect we will see Laws of Wrath on the big screen, and I plan to be the first in line for a ticket. Eriq La Salle, perhaps best known to television audiences as Dr. Peter Benton of “ER” fame, will have readers on the edge of their seats with the latest in his new thriller series. Laws of Wrath is proof that La Salle may add to his list of laudable accomplishments, “great author,” with his spinning of this tale of New York’s finest, brothers in blue, Quincy and Phee. Both men have their secrets, both have brothers that have brought some difficulties into their lives, both have women they love fiercely —though perhaps not enough, and both are haunted by some demons from their past. Laws of Wrath centers on the murder of Phee’s transvestite brother, A.J., whose body is found mutilated as the result of a sacrificial murder. In the morgue where A.J.’s body lies, is Carmen Morales, another victim of a similar slaughter. With flashbacks to Phee’s father’s earlier years of crime, Eriq La Salle provides a colorful back story that holds the keys to the mysteries of the murders. While someone seeks to bring justice to the long ago deeds of Phee’s father, Phee and Quincy are on the trail. They are assisted by some unusual characters, including The African, a bodyguard and a former child soldier; and Dr. Zibik, a genius and Satanist who is spending time in prison and is believed to be responsible for two prior similar sacrificial murders. Readers are offered glimpses of 1970s Harlem, a close-knit transvestite community, and the brotherhood of New York’s finest. While essentially a thriller, Laws of Wrath does not skimp on the personal stories and intimate relationships of the main characters. Readers will identify with Phee whose own past failings have bubbled to the surface and now threaten his career and his love interest; and they will empathize with Quincy as he discovers troubling details about someone close to him. Added to these colorful characters is a group of Satanists that take the lives of others in an effort to steal the souls of their victims. Eriq La Salle has made for a demanding and satisfying thriller that is sure to keep readers turning the pages. Laws of Wrath, by the multi-talented Eriq La Salle, is proof positive that Mr. La Salle is not a one-hit wonder. Quite to the contrary; with Laws of Wrath he has hit another Grand Slam! Following his debut novel, Laws of Depravity, he has skillfully crafted another amazingly captivating novel that will have you losing sleep and postponing chores, just so you do not have to take a break from the story. I have seldom encountered a novel so penetrating and incisive. With Laws of Wrath, I have now read two such mesmerizing literary achievements, and they were both written by Eriq La Salle. As if that isn’t enough, he concludes Laws of Wrath in a way that marvelously sets up the next story in this series. I, for one, cannot wait to get my hands on Book #3; it promises to be just as expertly created as were its predecessors. 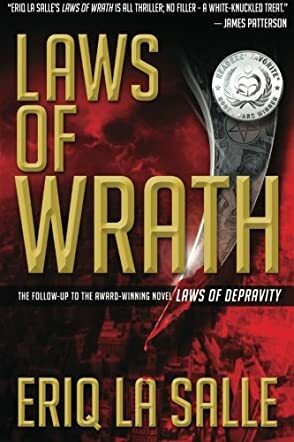 Laws of Wrath begins roughly two weeks after the conclusion of Laws of Depravity, and features most of the same familiar characters from that first superb story. Police partners Phee and Quincy return, along with their love interests, their extended families, and professional allies, as the partners try to stop another heinous killer before more deftly and horrendously mutilated bodies turn up. It soon becomes apparent that somebody is targeting Phee’s father, Clay Freeman, and his one-time partner in crime from his much younger days, Blue Morales. However, Clay and Blue could not think of a single person who might have reason to direct such ghastly vengeance their way. The many sub-plots woven into Laws of Wrath are fascinating, some gruesomely so. Mr. La Salle has peeled back the thin veneer of civilization with surgical precision, and shown us some of the almost inconceivably ugly realities lingering just under the surface. Laws of Wrath is outstanding fiction, with its basis firmly planted in the non-fictional evil man is capable of committing. I cannot find words adequate to express how much I recommend reading this book. You may be the only person at the water cooler who does not know what everybody is talking about, if you fail to read Laws of Wrath.